35 mins adventurous panoramic mountain view flight. Lifetime opportunity to be face to face with Mt. Everest. Walk on Sir Edmund Hillary and Tenzing Norgay Sherpa attended path. Observe the world's highest peaks like Mt. Everest (8,848m / 29, 028ft) Lhotse (8,516 m-24,940 ft), Nuptse (7,855m-25,772 ft), Mt. Makalu (8,463m/27758ft), Mt. Pumori (7,161m/23488ft), Tharmarsarku (6,623m/21723ft) including majestic Mt. Amadablam. Trek on a World Heritage Site - Sagarmatha National Park. Visit Buddhist Monasteries located at high altitude. Explore legendary Sherpa's Capital Village - Namche Bazar. Everest Base Camp (EBC) is situated at an altitude of 5,380 m (17,600 ft) on the south side of the Mount Everest (Sagarmatha in Nepali and Chomolungma in Tibetan) in Sagarmatha National Park of Nepal. This is the first base camp that is used to spend one overnight prior to climb Mt. Everest. The first Sagarmatha Himalaya submitter Sir Edmund Hillary and Tenzing Norgay Sherpa used this path in 1953. Afterwards, trekking to Everest Base Camp was popularly known among mountain lovers. 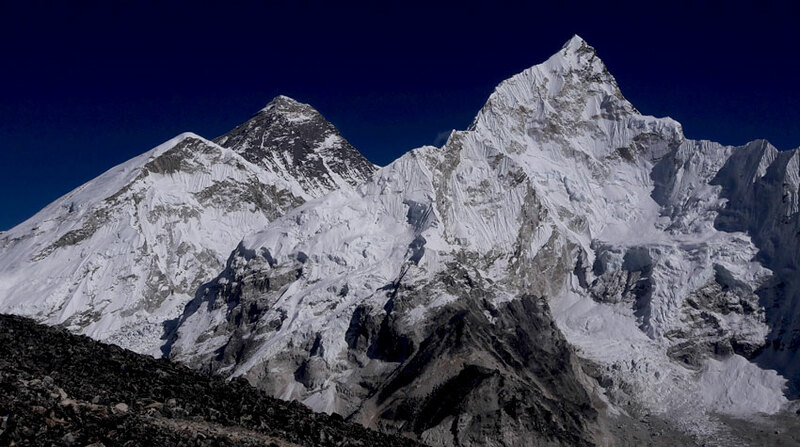 Mount Everest is the highest mountain in the world by elevation, measured 8,845 meters (29,029 ft) above sea-level. Due to its uniqueness, UNESCO listed it in Natural World Heritage Site that people must visit in a lifetime. And to observe this snow-capped miraculous, thousands of adventure lovers visit Nepal to attend Everest Base Camp Hiking. In this Everest Base Camp Trek, Kala Patthar (5545 m / 18,188 ft) located above Gorakshep, present an awesome view of Everest Massif. The world's highest webcam, Mount Everest webcam, is located at Kala Patthar. This place equally caters the spectacular views of Mt. Nuptse, Changtse, Lhotse and many other highest peaks. To reach Nepal's Sagarmatha Base Camp, trekking is the only one route to the traveler. There aren't any road attached to the base of Everest from Nepal neither via air. One needs to hike for 6 to 8 days from Lukla or 2 weeks from Jiri allowing for proper altitude acclimatization in order to prevent altitude sickness. Tenzing–Hillary Airport popularly known as Lukla is the nearest small airport to begin Everest Base Camp Trek. It is also considered as the most dangerous airport in the world due to the short, narrow and ascending runway surrounded by giant hills. Sherpas settled in this region use this airport as the means of transportation to bring their daily necessaries items, goods, and luggage. For Everest climbers, the base camp has been divided into four section as per the altitudes and difficulties. They are Everest Base Camp I, II, III, and Everest Base Camp IV. And in this trek, you will reach up to the first among four Base Camp. The day by day Itinerary for this hiking are mentioned below. In this Everest Base Camp Trek Package, your journey to the base of Mount Everest begins with an adventurous 35 minutes flight from Kathmandu to Lukla. Early morning, our guide will receive you at your hotel and drive to Kathmandu Domestic Airport. Traffic Jams are uncommon during the morning time and you will reach the airport without worry. Airport checks in and collect the boarding pass. Since Lukla is located in the hilly area, climates changes frequently. So, the clear weather is vital to operating the flight. Your flight might not fly on time and may get several hours delay. Therefore patient is very important here. If the weather permits fly to Lukla. This flight caters a lifetime opportunity to discover the lofty snow-capped Himalayas of the world. After approaching at Lukla Airport, prepare backpacks then commence hiking. The first overnight destination of Everest Base Camp Trek is Phakding. The path follows along with Dudh Koshi River, Cheplung Village and view of the Kusum Kangraru Mountain. On the second day, hike ascending up to the Namche Bazar - the capital of Sherpa. Spend one extra night here for acclimatization. Similarly, after spending another four nights you will reach the base camp of Mt. Everest. Day 05: Trek to Dingboche. Day 06: Acclimatization day at Dingboche. Day 07: Trek to Lobuche. Day 08: Trek to Everest Base Camp and stay at Gorakhshep. Day 09: Hike to Kala Patthar, trek down to Pangboche. Day 10: Trek to Namche Bazar. Drop to your hotel. Everest Base Camp Trek finished here! Wants some modification on Everest Base Camp Trek itinerary? contact us to customize it.